Coal is used to produce electricity and steel, but it also releases more carbon emissions than any other fossil fuel. One of the crucial factors in determining whether we can avoid catastrophic climate change is how quickly we can curtail our carbon emissions from coal. We all owe a debt to coal. Western industrial civilization was forged with coal, the most abundant, accessible and easy to handle of the fossil fuels. Unlocking coal's power allowed mankind to harness previously undreamt of quantities of energy, illuminating the world, animating machines and moving people faster than ever before. Most people in the Western world continue to think of coal as an energy source from a bygone era but this is far from the case. While it is true that "king coal" has lost its spot as the most important energy source in the world, to oil and potentially later this century to gas, it is still an important contributor to most industrialized economies. Coal powers over half of America's electrical grid, and is important for power in every province except British Columbia and Quebec. Coking coal is used in making steel and cement, which also helps fuel demand. 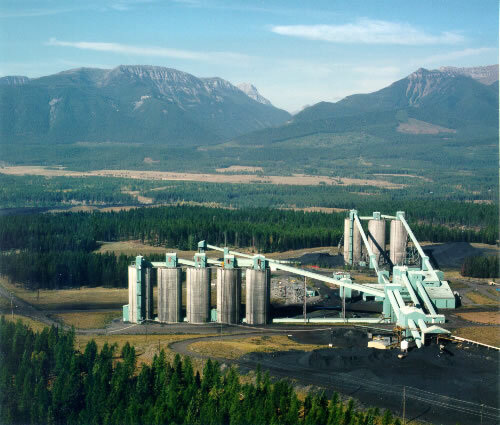 British Columbia mines millions of tons of coal, both for coking and power generation, and exports it around the world. Just as the Western world first industrialized on the backs of coal miners in the 19th Century, the developing world is doing the same today. Global coal demand is expected to rise 56% by 2030, the entire increase coming from emerging economies, spearheaded by China. The relative abundance of coal and the relatively simple technology of mining it and burning it (as opposed to say operating a nuclear power plant) makes coal the obvious choice for power in many countries. This poses civilization with a virtually insoluble dilemma. Coal power produces myriad environmental problems, from watersheds destroyed by mining, to millions of tons of fly ash and toxic effluents released into the air through its combustion. Most ominously, coal power produces more carbon emissions than any other form of power generation. China, for instance, is currently constructing an average of two coal-fired power plants a week, and as a result is projected to produce as many carbon emissions by 2030 as the entire world did in 2008. Many experts hold out hope that carbon capture and sequestration technology, literally pumping the carbon from coal plants underground, can avert climate disaster. Alarmingly, as of this writing, the development and deployment of this technology is proceeding at a glacial pace. World Energy Outlook 2009. International Energy Agency, 2009. p. 10. Coal is an ignitable organic rock that forms over hundreds of millions of years from the compression of vegetation from ancient forests, a process that continues to this day. The carbon in the organic remains is concentrated and progresses t1``hrough five stages of increased carbonization. As a general rule, the older the coal the higher the degree of carbonization. 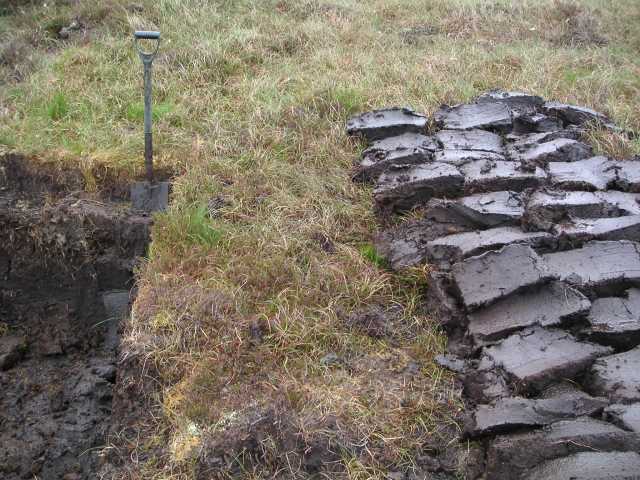 Peat, the transient phase between decayed vegetation and coal, dug out of a bog in the United Kingdom. Peat: The first stage of carbonization is peat, which is not technically coal. Peat has yet to be subjected to the extreme compression that leads to fossilization and so most of the water has yet to be squeezed out. It can be burned for fuel—and in many less developed parts of the world it is—but it does not produce much energy. Lignite: The second stage of carbonization is lignite, the lowest rank of coal and sometimes referred to as "brown coal". The carbon content in lignite is only around 25-35%; the rest is water. As such it still produces limited amounts of energy (3,500-4,600 kcal/kg) but since it comprises about a quarter of all the coal in the world, it is widely used for electricity generation in poorer countries. Sub-bituminous Coal: Sub-bituminous coals, or "soft coals", fall in the middle, with a 35-50% carbon content and an energy content of 4,600 to 6,000 kcal/kg. Sub-bituminous coal is used throughout the world, primarily in thermal power stations but also for cement making and other industries. Bituminous Coal: Bituminous grade coal, is the primary coal used in electric generation (steam coal) and in metallurgy(coking coal). About half of all the coal burned in the world is this grade. It ranges from 50-86% carbon content and any energy content above 6,400 kcal/kg. Anthracite: The fifth and final degree of carbonization leads to anthracite, "hard coal". With any carbon content greater than 86%, anthracite is the least common and therefore the most expensive grade of coal. Its high cost and the ventilation requirements make it impractical for use in power-plants. On the other hand, its low soot and high smoke content makes it useful for burning in residential heating. Coal occurs in underground or surface seams that can be extracted, either through underground mines or surface mining. Underground mining is an umbrella term for a number of techniques that involve tunneling into the Earth. Unlike metal ores, great quantities of coal must be mined in order to be economical, and this is more difficult in an underground mine, making these mines less popular today in developed economies. On the other hand much less energy is required to operate an underground mine. They are also far more dangerous for the workers inside. Before huge earth-movers became available and high safety standards became the norm, this form of mining was much more popular, and evocative of the early phases of the West's Industrial Revolution. For the same reasons it is still prevalent in many developing countries today, such as China and India. In surface mining, the rocks overlying a coal seam are removed entirely and the coal is gouged out of the earth by colossal bucket-wheels excavators. To give an idea of the scale of these machines, Germany's Bagger 288 excavator is the largest land vehicle in the world. 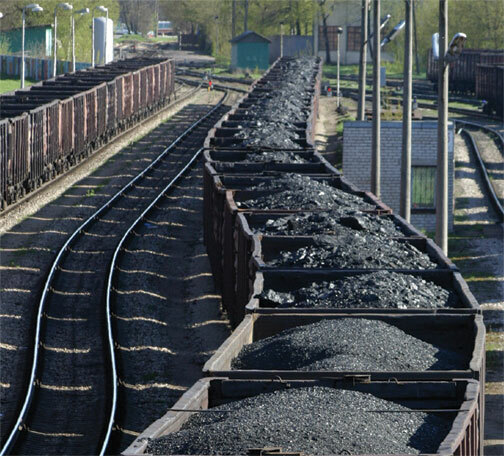 It can fully load 2,400 train wagons with coal in a single day. The German coal bucket-wheel excavator Bagger 288, the largest land machine in the world. There are a variety of surface mining techniques, including strip mining, open-pit mining and mountain-top removal mining. While surface mining is far more efficient at removing vast quantities of coal quickly, and involves fewer risks to the miners, it is also more environmentally damaging. Mountain-top removal mining, common in the American Appalachians, is particularly controversial as it can--and often does--permanently destroy local ecosystems and irreparably alters regional topography. A train moving a load of coal. Once the coal is extracted it is moved to the thermal power plants and industrial centres where it is used. It is difficult to imagine the immense quantities of coal involved, and it is equally difficult to conceive of the enormous road, rail, and naval infrastructure that exists around the world to get the rock from mine to market. For instance, the 1,500MW Kingston Fossil Plant in Tennessee consumes around 14,000 tons of coal a day, enough to fill up 140 railcars. When you consider that there are 1,395 coal-fueled generating units in the United States spanning 48 states, it follows that the size of this coal infrastructure must be immense indeed. Coal has a number of uses, the most common being electricity generation. Coal used for this purpose is known as steam coal. Once it arrives at an electric power-plant the coal is pulverized into a talcum-like powder, and then blown into a boiler where it ignites. The resulting heat turns a pool of water into steam, which then drives an electricity-generating turbine. The technology is simple, which helps explain coal's dominance at the beginning of the Industrial Revolution, and its popularity in the developing world today. The boilers in most coal plants operate at less than 550˚C and convert only about 33-35% of the total energy in the coal into electricity. These are known as subcritical plants. In a drive to increase efficiency, new metals are being used to make boilers and turbines that can withstand intense heat for prolonged periods. These new plants, known as supercritical, burn coal at 550˚C to 590˚C and have an efficiency of 40%. Some industry experts expect that ultra-supercritical plants, which work at temperatures of 760˚C and have an efficiency of 47%, to be the norm by 2020. Improvements in efficiency will help global coal reserves last longer and mean less carbon is released into the atmosphere for the same energy output. Coal also plays a role in about 70% of the world's steel production, by using coking coal for smelting in blast furnaces. In this process, high grade coal is cooked in an oven to burn off impurities until it is merely a lump of pure carbon. Iron is then alloyed with the carbon, or coke, to make steel. The remaining 30% of steel is produced with electric arc furnaces that do not require coal and emit far less carbon. Coal fuels a number of other industrial processes. Making cement, for instance, is a very energy-intensive activity and many countries rely upon coal to provide this energy. China relies almost exclusively on coal to fuel its cement production, which amounted to almost half of the entire world's 2.7 billion tons of consumption in 2007. In some cases coal effluents such as fly ash are used in the cement itself. Classification of Coal, The Engineering Toolbox, accessed May 6, 2012, http://www.engineeringtoolbox.com/classification-coal-d_164.html. U.S. Energy Information Administration. Coal Factsheet. 2010. Krupp, F & Horn, M. Earth: The Sequel, (London: Norton Books, 2009), 168. Most of the world's coal began to form in the Carboniferous Period, when much of the world's continental plates were submerged in shallow vegetated seas 300-360 million years ago. Though these Carboniferous deposits are the richest and most common, almost every geological era has left behind coal beds and today deposits are found all over the world. A graphic showing the world's supplies of fossil fuels. Unlike oil, which is concentrated in the Middle East, the world's major economies have abundant supplies of coal. Since there are few geographic restrictions on where a thermal coal plant can be built, it is generally the case that the plants are built near the coal. This is part of the reason that, in sharp contrast with oil, up to 90% of the coal mined in the world is used in the country it is produced. It is also perhaps fortuitous that the largest economies in the world also possess some of the largest coal reserves. Coal Output in 2005 shown as a percentage of the top producer. The major production centres roughly correspond to the world's major economies: Eastern North America, Central Europe, and China. Significantly, the secondary centres are in India, Indonesia, South Africa and Australia, all rapidly growing economies. Krupp, Fred. 'Earth: The Sequel.' (New York: Environmental Defense Fund, 2008. ), p. 167. Coal is cheap for four reasons. Firstly, as a solid it is the easiest fossil fuel to utilize. It can be dug out of the ground in thick veins, shoveled into railway cars and then deposited in a boiler. The entire process can be done with relatively simple technology and this is largely why coal was the first fossil fuel to be widely used during industrialization. Liquid oil has to be contained in a vessel of some kind, while energy suppliers have only relatively recently figured out ways to harness natural gas. Secondly, coal can also usually be found near the industrial regions where it is needed. Coal reserves in Appalachia and Inner Mongolia are huge factors in the economic miracles in the United States and China, while German and British coal reserves (though now mostly exhausted) helped make those countries superpowers a century ago. Since such massive quantities of coal are required to get a good energy return, ease of access is a blessing for these energy-intensive economies. Third, because there is so much coal being mined in so many places, the market is less prone to major fluctuations in price when there is a supply disruption. Economists and security experts are constantly wringing their hands over what a major hurricane in the Gulf of Mexico or a terror attack on a Saudi Arabian oil terminal would do to oil prices, and the havoc that could cause the entire global economy. Conversely, coal supplies are less tight, the supply network is less vulnerable to major disruption from a single event, and when there is an accident—such as a major mine collapse in China's Shaanxi province—the effect is usually localized to the country where it happened. Finally, coal power is cheap because, depending on the region, the external costs of coal use have not been factored into the final price of electricity. This means that power companies do not charge for the adverse environmental effects of coal power at every stage of production. These include the environmental damage wrought by mining, the negative health effects of toxic emissions from coal plants, and the release of green-house gas emissions into the atmosphere. The final price of coal measured in the electricity it generates per kilowatt-hour, varies depending on where it is produced, and a number of studies have shown different results. 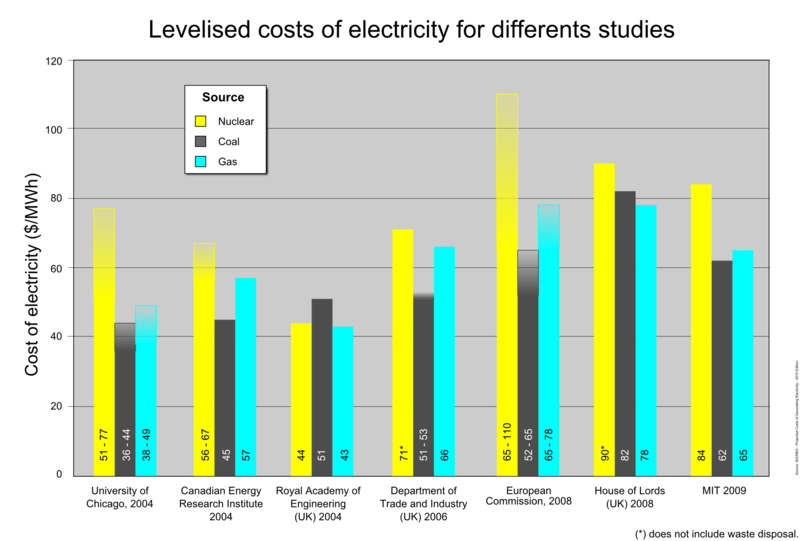 Studies tend to show that in many conditions coal power remains cheaper than either nuclear or natural gas, coal's two main rivals. This will likely remain the case until carbon taxes come into effect. As you can see, in all but a single study, coal comes out cheaper than its two main competitors for the electricity market: nuclear power and natural gas. A 2010 study by the U.S. Department of Energy compares estimates of how much electricity from a power plant built in 2016 will cost. The total levelized cost includes all the costs of the energy, from the cradle to the grave. The DoE also calculated in a 3% carbon tax for carbon-intensive forms of energy generation that don't include carbon capture and sequestration, such as conventional coal plants or coal-to-liquids. 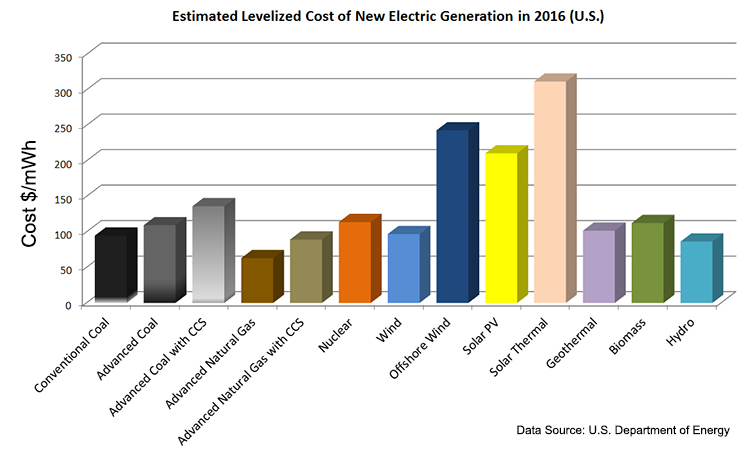 This graph depicts what the total cost of electricity from each power source is expected to be in 2016 from a plant built that year by the U.S. Department of Energy. Conventional coal plants remain among the cheapest, save for the newer natural gas plants which have levels of efficiency that coal utility operators could only dream of. Still wind, geothermal and hydro are quickly becoming competitive. Under these conditions, at $0.09 per kWh (divide the megawatt hours by 1000 to get the kilowatt-hours) conventional coal is now on par with onshore wind and hydroelectric power, as well as several different types of natural gas-fired plants. Advanced coal power plants, such as ultra-supercritical plant designs that are on the drawing board now, and coal plants with carbon capture and sequestration are closer to $0.10 and $0.13 respectively, which is much cheaper than solar thermal power, or offshore wind. If the world is going to take any meaningful action on climate change, making it more expensive to build and operate coal power plants will be essential. Many countries are already implementing carbon taxes and many others are developing regulations that will force coal plants to rein in their carbon footprint. The addition of carbon capture and sequestration technology, which in the minds of most scientists is the only way to continue to use coal power in a sustainable way, will have a considerable impact upon the final price of coal generated electricity. Of course the technology has to be invented and deployed first, which may never actually happen. The mining of coal has far-reaching environmental and health effects. Surface mining, the most widely employed form of mining in developed countries, requires that all the vegetation and rock overlying a coal seam is removed. This destroys habitats and wrecks the natural waterways, which also increases the chance of flooding later on. The waste rock—from both surface and underground mines—can block up waterways and contain toxic heavy-metal runoff, such as mercury or cadmium, that is damaging to plant and animal life and can contaminate groundwater that nearby communities rely upon. Scientists have identified a link between those living near coal mining and higher rates of a variety of chronic illnesses. As one study conducted in West Virginia found, "residents of coal mining communities have a 70 percent increased risk for developing kidney disease; a 64 percent increased risk for developing chronic pulmonary disease like emphysema; and are 30 percent more likely to report hypertension." 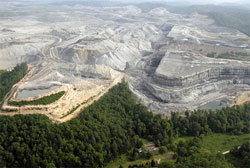 Mountain-top removal mining in Appalachia. This mining technique is hugely controversial because of the dramatic impact it has upon the landscape. Today in most developed countries, after an area's economically viable coal reserves have been tapped, the land is usually reclaimed. This means replacing the rocks to restore the region's original topography and replanting vegetation atop the former mine. The United States and Canada have passed Land Reclamation laws forcing mining companies to restore the land close to its original condition. When done correctly, land reclamation can be highly successful. The Mineral Information Institute logs many examples of reclamation operations across the United States where the land has been "returned to a condition matching or improving its original use." There are regions where it is difficult or impossible to fully reclaim the land, such as the American Appalachians. Because of the steep, mountainous regions a mining technique known as mountain-top removal is employed that often irreparably alters a region's topography. Because of the difficulty and expense of reclaiming land in some areas, the land reclamation rate in most OECD countries is somewhere from 50% to 70%. Developing countries are far behind in this metric: land reclamation rates in China are only around 12%, though they have a larger portion of underground mines which do not require as extensive reclamation. Trees killed by acid rain. Coal is the number one cause of acid rain worldwide. When coal is combusted it releases gases into the atmosphere, known as flue gases , as well as creating millions of tons of fly ash. The flue gases contain a number of toxic chemicals, the quantities depending on the grade of coal that is burned and the filters employed at the plant where it is burned. These include soot, nitrogen oxides, ozone and sulfur dioxides. When emitted soot contributes to smog, and nitrogen and sulfur dioxides cause acid rain. All of them contribute to serious lung complications such as asthma. A number of toxic heavy metals are released into the environment as well when coal is burned: arsenic, lead, selenium, mercury and cadmium, among others. Studies show that ingesting these pollutants, either through inhaling them or eating food or drinking water contaminated with them does have serious, measurable health consequences. Cleaning the coal begins before it is burned with coal washing: a process that removes metal impurities from the coal which, if combusted, would be highly toxic. This is done by putting the pulverized coal in a fluid that is dense enough for the coal to float on, while metals sink to the bottom. Then the pulverized coal is burned. In the combustion chamber devices called Low NOx burners work to keep a minimum of oxygen available, reducing the formation of acid-rain causing nitrogen oxide by 40 to 60%. Next, as the gas leaves the combustion chamber they are sprayed with a mixture of limestone and water. The sulphur dioxide in the flue gases react with the limestone and form gypsum, which can be recycled and reused in the construction industry. These Wet Scrubbers are effective at preventing almost 99% of coal's sulphur dioxide emissions. Finally the particulates are filtered to prevent them from entering the atmosphere. There are a number of different systems for doing this but the most common are electrostatic precipitators. They create an electromagnetic field that negatively charges the particles in flue gases and forces them onto a positively-charged plate where they can be removed. This system removes around 99% of all the soot particles. The primary gas that remains to be emitted is carbon dioxide, which was not seen as a dangerous pollutant until much more recently. The implementation of these emissions-cleaning technologies since the 1970s has had a marked effect upon the environmental impact of coal power, particularly in OECD countries. In the United States, about 66% of all sulphur dioxides and 40% of nitrogen oxides released into the atmosphere originate from electricity generation plants, primarily coal burning ones. After many years of lobbying, the U.S. implemented a cap-and-trade program on these emissions in 1990. Since then SO2 emissions have declined by half to 8.95 million tons a year. 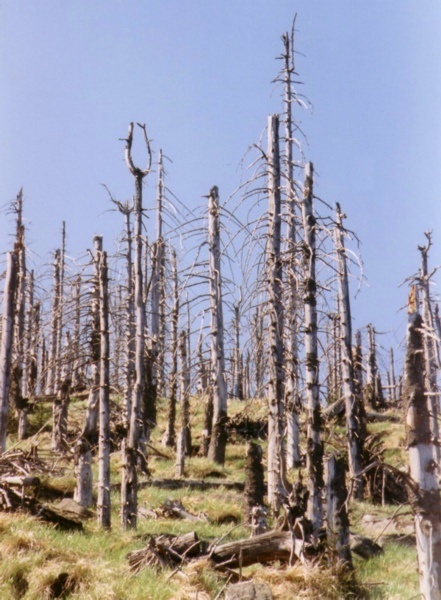 Acid rain events have declined by two thirds in the same period. This happened despite a huge expansion of American coal-generated energy capacity. This cap and trade program has been pointed to as a potential example of what a successful carbon dioxide cap-and-trade program could look like. It should be noted that the term "clean-coal technology" is often thought to refer to coal technologies that prevent coal from releasing climate-change causing carbon dioxide emissions. This is not the case, and instead the term just refers to the particulates and impurities cleaned by the technologies just described. Technologies that prevent the release of carbon dioxide into the atmosphere are usually referred to as Carbon Capture and Sequestration and these are still only in the experimental phase. Asides from the millions of tons of flue gases released during coal combustion, the solid remains of ash create a considerable waste problem. There are two kinds of ash, the fly ash which rises with the flue gases and is then captured by electrostatic precipitators, and the bottom ash which is heavy enough to remain inside the boiler. Collected together, the quantities of the ash are truly colossal: coal plants in the United States create around 130 million tons of coal ash a year. Typically this ash is disposed of at the plant by being dumped in nearby surface impoundments and landfills, although a considerable portion, perhaps as much as a third, is recycled for use as fill in concrete or wallboards. Coal plants in the United States create around 130 million tons of coal ash a year. Typically this ash is disposed of at the plant by being dumped in nearby surface impoundments and landfills. An American industry study found that 80% of the surface impoundments are unlined, as are 40% of the landfills. This means that the many toxic heavy-metals in coal ash have the potential to seep into groundwater with the attendant negative health effects for humans and wildlife. In rare instances, these coal ash impoundments can be breached and the sludge-like slurry can swamp entire communities. This is what happened in Kingston, Tennessee, in December 2008. A dyke ruptured and released over a billion gallons of ash slurry into the adjacent Emory River, flooding the outskirts of Kingston. The spill had the effect of bringing the regulation of coal ash into the public debate and the EPA has begun moving to regulate coal ash as a hazardous waste. This is a move that is currently vehemently contested by the coal utilities industry. An aerial photograph taken of the Kingston, Tennessee, ash spill on December 23, 2008. The spill killed a huge number of fish and led to elevated levels of dangerous metals in the Emory River. called these stereotypes into question. Among the surprising conclusions: the waste produced by coal plants is actually more radioactive than that generated by their nuclear counterparts. In fact, the fly ash emitted by a power plant—a by-product from burning coal for electricity—carries into the surrounding environment 100 times more radiation than a nuclear power plant producing the same amount of energy. This is because coal contains trace amounts of the radioactive isotopes uranium and thorium. When coal is burned these elements can be as high as ten times higher than their normal levels and released into the environment, usually in the so-called "stack shadow", a 0.8 to 1.6 kilometre radius around the plant. Still, even heightened exposure in these areas poses a low level health risk. A person living in the stack shadow has an annual radiation intake 0.3% above the background radiation. When it comes to coal, climate change is the elephant in the room that will have to be addressed in the years ahead. The burning of coal releases more carbon than any other type of fuel used by man, and accounts for around 20% of all green-house gas emissions, and that number is expected to rise quickly. A single 500-megawatt coal power plant emits as much as three million tons of carbon dioxide a year. Hopes are high for a variety of technologies that can either capture carbon dioxide and stash it back underground, or simply turn the coal straight into gas so that it is not burned at all. Progress has been slow, however, and there remains much work to be done. Persistent questions remain: Can coal power ever be carbon-free? Will capturing carbon ever be cheap enough to be economically viable? We will discuss these questions and the problem of coal and climate change in a supplementary article that will be added in the near future. Wet Scrubbers for SO2 Control, IEA Clean Coal Centre, accessed May 6, 2012. http://www.iea-coal.org.uk/site/2010/database-section/ccts/wet-scrubbers-for-so2-control? Coal and Climate Change Facts, Pew Centre for Climate and Energy Solutions, accessed May 6, 2012. Coal presents humanity with one of its most difficult dilemmas. On the one hand it is difficult to imagine a cheaper and simpler way to generate energy than burning what is essentially flammable dirt. On the other it is unequalled in its environmental toll: Not only does coal release millions of tons of hazardous effluents into the atmosphere, it has the largest carbon footprint of all the fossil fuels. As the implications of global warming come into sharper focus every day, it is becoming increasingly clear that our continued addiction to coal threatens to derail civilization. A graph showing the dramatic rise in coal consumption expected in the years ahead. 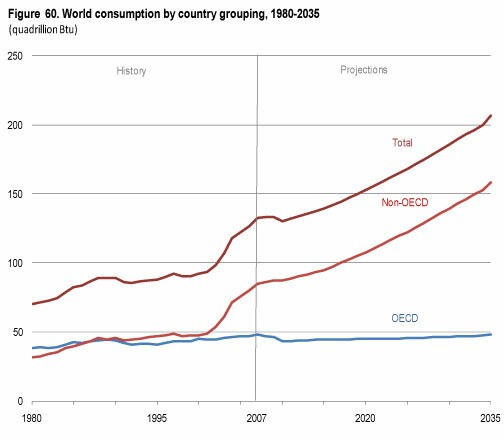 The light red line is coal use by developing countries. Worldwide coal consumption is expected to rise by 56 percent from 6.4 billion tons in 2007 to almost 10 billion tons in 2035. Coal's share of world energy consumption has been at 27 percent in 2007 and will increase to 28 percent in 2035. The main reason for the increase of only one percent is the growing use of renewable energy sources. China is believed to account for 75 percent of growth in global coal production from 2007 to 2035, Australia and New Zealand are expected to cover 10 percent together. Some jurisdictions, such as Ontario, are actively phasing out coal power, while others such as the E.U. and the United States, are banking heavily upon future technological solutions like that will make burning coal carbon-neutral. The future politics of coal will then depend heavily upon the development and deployment of Carbon Capture and Sequestration technology in the years ahead. Coal in truth stands not beside but entirely above all other commodities. It is the material energy of the country — the universal aid — the factor in everything we do. With coal almost any feat is possible or easy; without it we are thrown back into the laborious poverty of early times. With such facts familiarly before us, it can be no matter of surprise that year by year we make larger draughts upon a material of such myriad qualities — of such miraculous powers." Until the 1960s coal remained the dominant form of energy used in the world, until it was supplanted by oil, which was more convenient for transportation and provided higher energy intensity. Because of an increasingly unfashionable reputation in the West, coal continued to lose its share of the total world market to the other fossil fuels down to the year 2000. But in the past decade a remarkable thing has happened: coal's share of the world's energy pie has begun to expand again, growing faster than any other fuel. This trend has been propelled by soaring demand from economies like India, South Korea, and South Africa. But head and shoulders above them all is China. The People's Republic, who ten years ago roughly tied for first place with the United States in coal production, has tripled their coal use in the past ten years alone and now consumes almost half of all the coal used in the world. And it should be noted that coal use never seriously diminished in the West. It has just been taking a progressively smaller part of an ever-increasing pie. Coal still accounts for slightly under half of U.S. electricity generation and plays a central role in the economies of the Appalachian States. Globally coal accounts for 40% of all electricity generation. Coal plants, railways and mines are opening up all over the world (particularly in China) and they are designed to be operational for at least 30 years. If for no other reason, because of these massive ongoing investments, we should be under no illusions that coal is here to stay. There is far more coal left in the Earth to be combusted than there is natural gas (though new kinds of unconventional gas are changing this) or oil—and investors realize this. The past decade has seen a massive expansion of coal-based infrastructure: coal plants, railways and mines are opening up all over the world and they are designed to be operational for at least 30 years. Because of these massive ongoing investments, if for no other reason, we should be under no illusions: coal is here to stay. Up to this point coal's relative abundance, along with the large volumes needed to generate electricity, have not made it economical to trade internationally. This is changing. China's insatiable demand is leading that country to run down her deposits at an alarming pace, and in response the government is considering putting a cap on domestic production. It has no intention to put a cap on domestic demand, meaning the Chinese are increasingly looking to fill the supply gap with imported coal. 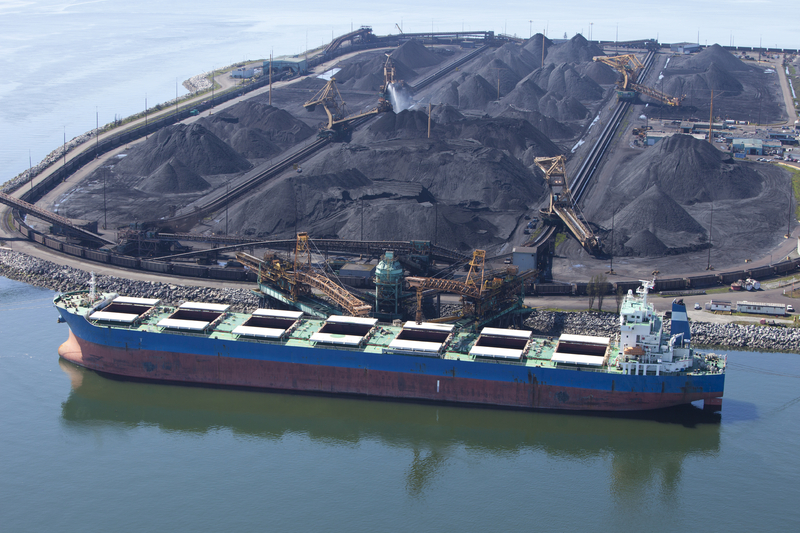 British Columbia, Australia and Indonesia already export large amounts of coal to East and South Asian countries, and this trade will likely grow in the years ahead. Future of Coal, MIT, 2001, accessed May 6, 2012, http://web.mit.edu/coal/The_Future_of_Coal_Summary_Report.pdf. For its size, Canada has comparatively small reserves of coal: about 6.5 billion tons, or 0.8% of the world's total; tiny Serbia's reserves are double that. Nevertheless the quality of Canada's coal reserves is high, and in Western Canada there are 22 coal mines in operation. In 2009 they extracted 63 million tons of coal, which may sound like a lot, but once again is a mere .018% of what was mined in China. Coal being prepared for shipping by rail at the Line Creek mine in southeast British Columbia. 60% of the coal mined in Canada is steam coal, and most of it is burned for electricity domestically. The remainder is coking coal, almost all of which is exported to Japan or South Korea. Some provinces rely more heavily upon coal than others, depending on their geography. Alberta, Saskatchewan and Nova Scotia, for instance, who have large coal deposits, generate most of their electricity from coal. B.C. and Quebec, on the other hand, have no coal power plants sat all ince they have enough rivers and mountains to generate almost all of their power from hydroelectric dams. New Brunswick and Manitoba also get small portions of their electricity from coal. Despite the environmental effects, the abundance of coal in Western Canada means the Prairie Provinces will likely depend upon coal for most of their electricity needs for the foreseeable future. Ontario, because of its huge power needs, has a diverse electricity generation portfolio and gets about 15% of its electricity from coal. Indeed, the Nanticoke coal plant in Southern Ontario is the largest coal thermal plant in North America. Since Ontario has no coal deposits of its own, it must import coal from America's Appalachian coal-heartland next door. Ontario Power Generation has come under intense scrutiny from environmentalists for its reliance on coal and intends to phase out coal-burning at all four of its thermal plants by 2014. They will be retrofitted to run on cleaner burning natural gas or biomass. As Ontario premier Dalton McGuinty said in 2007, "By 2030 there will be about 1,000 more new coal-fired generating stations built on this planet. There is only one place in the world that is phasing out coal-fired generation and we're doing that right here in Ontario." Mining and Using Coal, Coal Association of Canada, 2010, accessed May 6, 2012. Banyan, "Old King Coal." The Economist, February 25, 2012, accessed May 6, 2012. BBC News. 'Clean coal technology: How it works.' November 28, 2005. Accessed May 6, 2012. Cao, Xia. 'Regulating mine land reclamation in developing countries: The Cast of China.' Land Use Policy, Vol. 24, Issue 2, April 2007, 472-483. CBS News. 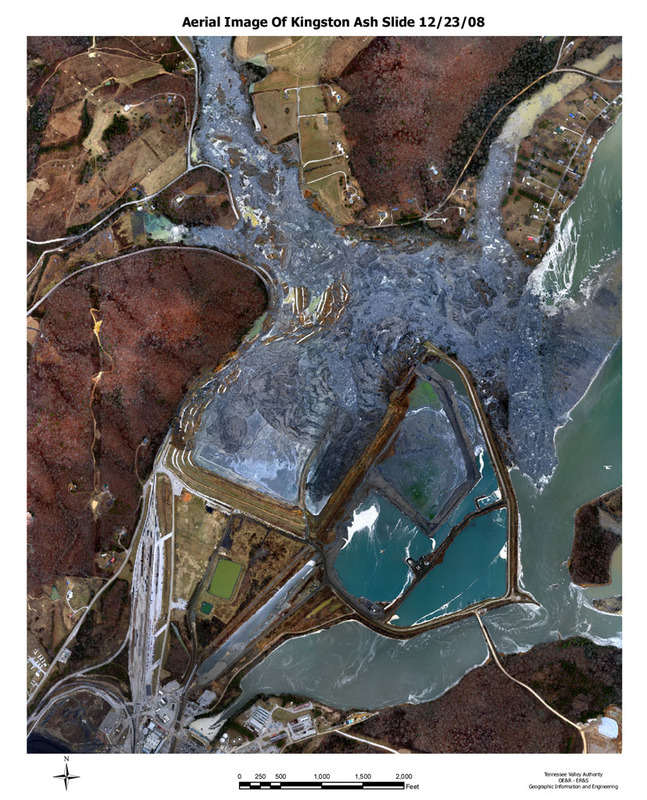 'Coal Ash: 130 Million Tons of Waste.' August 15, 2010. Accessed May 25, 2012. Coal Association of Canada, 'Mining and Using Coal.' (2010). Accessed May 6, 2012. CTV News. 'Ontario Liberals promise to close coal plants by 2014,' June 18, 2007. Accessed May 6, 2012. Dowdey, Sarah. How Stuff Works. 'How Acid Rain Works.' Accessed May 6, 2012. The Engineering Toolbox. "Classification of Coal." (2011). Accessed May 6, 2012. FuelTech Products. 'Low NOX Burners (LNB).' (2011). Accessed May 6, 2012. Hopey, Dan. 'W. Va study unearths higher health risks in coal mining communities.' Pittsburgh Post-Gazette, March 16, 2012. Accessed May 5, 2012. Hvistendahl. Mara. 'Coal Ash is More Radioactive than Nuclear Waste.' Scientific American. December 13, 2007, accessed May 25, 2012. IEA Clean Coal Centre. 'Wet Scrubbers for SO2 Control.' (2011). Accessed May 6, 2012. IEA and Coal Industry Advisory Board. 'Power Generation from Coal.' (2010). Accessed May 6, 2012. Jevons, Stanley, The Coal Question. London: MacMillan & Co, 1865. Keating, Martha. 'Cradle to Grave: The Environmental Impacts from Coal.' Clean Air Task Force. (2001). Accessed May 6, 2012. Krupp, F & Horn, M. Earth: The Sequel. London: Norton Books, 2009. Malone, Robert. 'The World's Biggest Land Vehicle.' Forbes.com, March 12, 2007. Accessed May 6, 2012. Mineral Information Institute. "Land Reclamation," (2012). Accessed May 5, 2012. MIT. 'Future of Coal.' 2001. Accessed May 6, 2012. Pew Centre for Climate and Energy Solutions. 'Coal and Climate Change Facts. 'Accessed May 6, 2012. Tennessee Valley Authority Kids. 'Fossil Power.' Accessed May 6, 2012. Tennessee Valley Authority. Kingston Recovery. 2011. Accessed May 15, 2012. Thomas White Global Investing. 'Canada: Coal Demand Surges to a New Peak.' December 10, 2010. Accessed May 6, 2012. Union of Concerned Scientists. 'Coal vs. Wind.' 2012. Accessed May 6, 2012. U.S. Energy Information Administration. 'International Energy Outlook 2011.' September 19, 2011. Accessed May 6, 2012. U.S. Environmental Protection Agency. 'Acid Rain.' Accessed May 6, 2012. U.S. Environmental Protection Agency. 'Mid-Atlantic Mountaintop Mining.' Last modified September 11, 2011, Accessed May 6, 2012. World Coal Association. 'Coal & Cement.' 2012. Accessed May 6, 2012. World Coal Association. 'Coal & Steel.' 2012. Accessed May 6, 2012. World Energy Council. ' 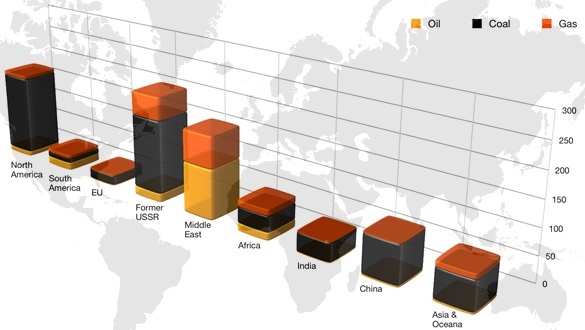 2010 Survey of World Energy Resources.' (2010). Accessed May 6, 2012.